Greg Abbott was born in Wichita Falls, Texas and currently is the Republican Governor of Texas. He first won election to the office in 2014. He is running for re-election in 2018. He attended the University of Texas for his undergraduate degree in finance, and then proceeded to earn his J.D. from Vanderbilt University Law School. After graduation in 1984, Abbott began a legal career in the private sector. On July 14, 1984, at age 26, Abbott was paralyzed below waist-level when an oak tree fell on him while he was jogging following a storm. He had two steel rods implanted in his spine, underwent extensive rehabilitation at TIRR Memorial Hermann in Houston, and has used a wheelchair ever since. He sued the homeowner and negotiated an insurance settlement worth more than $10 million dollars, resulting in payouts of $14,000 a month. Abbott initially entered state politics in Houston, where he was selected to serve as a state trial judge on the 129th District Court for three years beginning in 1993. Following that he was appointed by then-Governor George W. Bush to the Texas State Supreme Court, and was subsequently elected to the post twice more—first in 1996 to a two-year term and then again in 1998 for a six-year term. During this period, Abbott returned to private practice as an attorney for the law firm of Bracewell and Patterson Limited Liability Partnership and was also an adjunct professor at University of Texas School of Law. Abbott resigned from the Texas Supreme Court in 2001 to seek the position of Lieutenant Governor of Texas. His campaign for Lieutenant Governor had been running for several months when the previous attorney general, John Cornyn, vacated the post to run for the U.S. Senate. He then switched his campaign to the open attorney general's position in 2002. Abbott won the election and was sworn into office, becoming only the second Republican to hold the office since Reconstruction and became the longest-serving attorney general in Texas history. On July 14, 2013, speaking near the Alamo on the 29th anniversary of the accident that left him a paraplegic, Abbott formally announced his intention to run for Governor of Texas in the 2014 Texas gubernatorial election. In the first six months of 2011, he raised more funds for his campaign than any other Texas politician, reaching $1.6 million. He defeated his opponent by about 19 percentage points in the gubernatorial election. 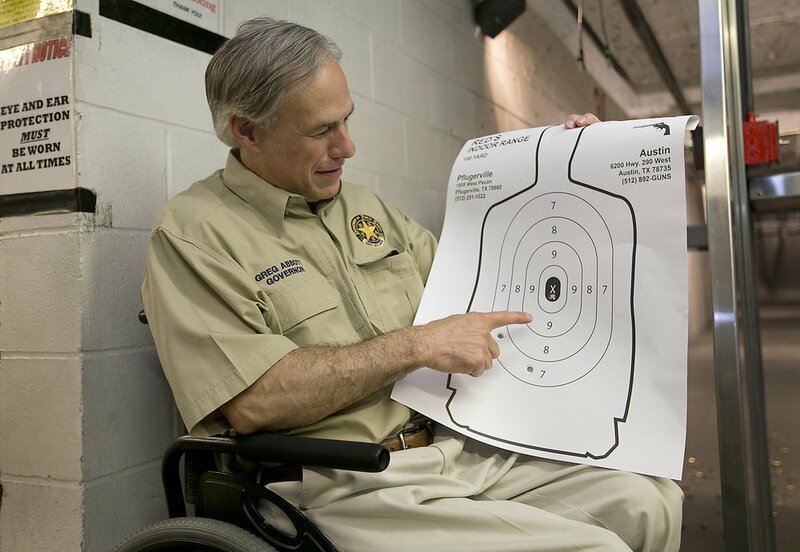 Greg Abbott has been endorsed by the National Rifle Association, The Combined Law Enforcement Associations of Texas, and Texans for Fiscal Responsibility along with several other organizations. I believe the right to keep and bear arms was settled in 1791 when the 2nd Amendment was adopted to the U.S. Constitution. On behalf of 31 states, I championed a landmark U.S. Supreme Court decision (District of Columbia v. Heller) that struck down a handgun ban and protected an individual’s right to bear arms while he was Texas’ Attorney General. I was also one of the first Attorneys General in America to challenge the Obama Administration’s efforts to use the United Nations to regulate guns in the United States. As Governor, I expanded 2nd Amendment rights, signing into law “campus carry” and “open carry.” As an avid hunter and member of the Texas State Rifle Association and National Rifle Association, I will continue to fight any federal government overreach that aims to disrupt the 2nd Amendment rights of law-abiding Texans. To fight the drug cartels and human traffickers from importing crime into Texas, I signed the toughest border security law of any state. As Governor, I signed a law banning sanctuary cities in Texas after naming it an emergency item during the most recent legislative session. It’s irresponsible and reckless to release known criminals back onto our streets. I also launched an anti-gang strike force to crack down on violent crime and gangs like MS-13. The strike force is a joint effort with local, state, and federal law enforcement in Harris County. I know that the minds that will power America’s future are being educated in Texas today. Since I took office as Governor, more Texas students are graduating from high school and college. Texas now has the third highest high school graduation rate in America. Of the top 100 public high schools in America, more are located in Texas than any other state, and Texas doubled the number of tier one universities. I passed education initiatives that fund optional, quality, accountable Pre-K, Math and Literacy Academies, “Read to Learn” programs. I know that when it comes to education, not all kids are the same. A one-size-fits-all approach simply doesn’t work. That’s why we need to empower parents to choose the school that’s best for their child. I know that it’s vital to keep the Texas economy an international leader. Since I took office, Texas has added more than 500,000 new jobs. More Texans have jobs today than ever before in the history of our state. I have repealed $250 million worth of professional fees that were barriers to Texans entering the workforce. In fact, if Texas was its own country, it would be the 10th largest economy in the world. I also promised to cut taxes, delivering the largest tax relief package in nearly a decade–more than $4 billion. The business franchise tax was slashed by 25 percent—a $2.5 billion tax cut. Property taxes were cut by more than a billion dollars.